For centuries, rumors have abound of a lowly caste of supernatural beings known as the Terrae Angeli or Earth Angels. Armed with the power to control Earth, Fire, Wind and Water, these warriors clandestinely serve as guardians for mortals in danger. Yet for one young angel-in-training, Griffin, life is hell as a cruel master makes his apprenticeship a nightmare. On the verge of failing, a new mentor, Basil, enters his life and changes it forever. Masquerading as the average teen next door, Griffin struggles to learn his trade under the tutelage of his strict, but kindly Mentor, navigate the ups and downs of modern life among humans (including falling in love with the girl next door), and prepare for the ancient trial-by-combat every apprentice must pass at sixteen or become mortal. I had never heard of Griffin Rising until I got it in the mail as part of a prize I had won. I was very intrigued by it, and once I picked it up and started reading it, I really couldn't stop. I haven't read too many angel stories, but Griffin Rising was definitely a unique spin on the angel mythology. It's a very quick read, only 174 pages, and story-wise it's pretty light. 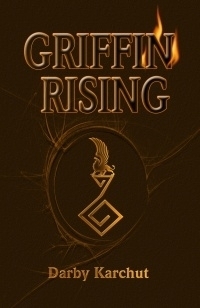 Griffin Rising isn't so much about Griffin the angel-in-training, but more about Griffin the teenaged boy that's trying to balance that with his life as a protector. Unlike most YA angel novels right now, there isn't some huge war being raged between heaven and hell in Griffin Rising. There aren't demons popping out of the ground and trying to kill Griffin, or Basil, (Griffin's awesome mentor). It's just Fin striving to pass his final test, and become an earth angel. It was nice to read something more subdued, more about the characters than about a flash and bang plot. This book is written from Griffin's point of view, which is a definite plus. There need to be more YA books from the male perspective, because they're just so fun to read! Guys think differently than girls, so it's fun to get inside a guy's mind as things are happening--like his first kiss, and going on dates, and all that. It's the other side of the coin that we rarely get to see. I really enjoyed Griffin Rising, and the ending left me really wanting more. I wasn't expecting that ending at all, so I need to sequel asap! 4 out of 5 stars. Ashley, thank you so much for your sweet review! You made my day! I'm glad you like the boy slant. I'll be sure to send you book two (GRIFFIN'S FIRE) when it comes out in April.